XYZ WP Popup is a popup plugin to display content in your pages as popup. The XYZ WP Popup – Premium contains different types of popups. Lightbox is a popup displayed over the webpage with a background called overlay. A sample image of lightbox is given below. This is another type of popup. This popup will display in the webpage as a short message. It has sliding and draggable options. A dialog box image is given here. The Full Screen Popup will display in the full screen. Quick Box is another type popup and this contains a title section and a body/content section. When triggered, we can see the title only. We can see the body/content if we click on the title. The Quick Box with Title only is given below. Quick Box with Title and content are given below. We will get this when we click on the title. Quick Bar is another type of popup which can be stayed permanently in a webpage. You can display quick links and quick contents in the quick bar. An image of quick bar is given below. You can see the following menu items when selecting the XYZ WP Popup Premium plugin from the admin area. 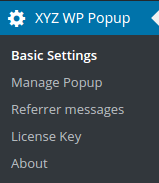 The Settings page contains the basic settings of the XYZ WP Popup. In the Manager Popup you can create new popups or edit the existing popups. In the Referrer Messages section, you can create and manage referrer messages.